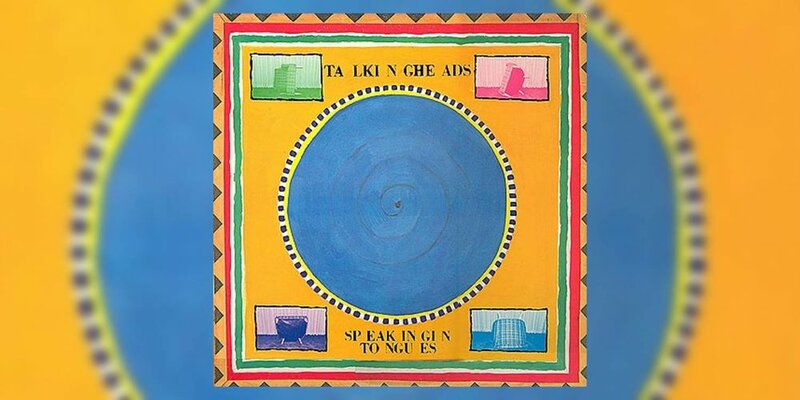 Happy 35th Anniversary to Talking Heads’ fifth studio album Speaking in Tongues, originally released June 1, 1983. Few bands from the ’70s and ’80s were anything like Talking Heads. They were a weird, edgy, musically diverse experimental rock group, seemingly borne out of a hybrid of a Federico Fellini and Jim Jarmusch film. But when they decided to ease up on the “experimental” and focus more on “rock” and even pop, they were better than many rock and pop groups during that era. Their fifth album Speaking in Tongues, released 35 years ago, demonstrates their expertise. Talking Heads were born out of the New York punk/new wave scene in the mid ’70s. They were literally an “art rock” band in that three of its members had attended the Rhode Island School of Design. Made up of David Byrne (lead vocals, guitar), Tina Weymouth (bass), Chris Frantz (drums), and Jerry Harrison, they began recording music in the mid to late ’70s. Talking Heads were known for being both ahead of their time and prolific. In terms of the latter, the group banged out four excellent albums in a little over three years. But they were also consistently ahead of the curve. Rock/Afrobeat fusion and electronic music wasn’t something that many rock bands attempted in the late ’70s, but the Talking Heads pulled it off and owned it with Fear of Music (1979) and Remain in Light (1980). After Remain in Light’s success, the group took a hiatus, to return nearly three years later with Speaking in Tongues. Byrne recorded music by himself as well as with the group’s frequent producer Brian Eno, while Weymouth and Franze recorded together as the funk rock group, Tom Tom Club. Rather than bring back Eno to produce Speaking in Tongues, Talking Heads produced the album themselves, and decided to make it more commercially accessible than their previous releases. The subject matter behind the lyrics is still difficult to decipher, but the music is about as close to mainstream as they had ever approached at that point. “Burning Down the House,” the album’s opening track and lead single, was also the group’s most commercially successful single. According to Weymouth, the song was inspired by a Parliament-Funkadelic concert that Frantz attended. The group uses synths to slowly build the track’s energy, eventually pulsing with energy, joined by the rocking guitar riffs and hard-charging drums. “Girlfriend Is Better” is a synth-driven song, churning away with mechanical, factory-like precision. Lyrically, Byrne assumes the role of cheating boyfriend, remorseful of his actions, acknowledging that he should have stayed faithful. While it’s harder to discern what Byrne is singing about on “Slippery People,” it’s another of the more musically interesting songs on the album. It’s anchored by a plucky bassline, percussion, and a staccato, Morse code-like synth track. The album closes with “This Must Be the Place (Naïve Melody),” the album’s second single, and, in my opinion, the best song they ever recorded. By the standards of most Talking Heads songs, it’s stripped down and straight-forward, with the guitars, drums, and percussion remaining understated, while the majority of the music is generated from a Prophet 5 keyboard. Reportedly Byrne himself played the synth on the track, creating the song’s bassline, and creating flute and trumpet-like sounds through expert manipulation, particularly the use of pitch-bending. The lyrics for “This Must Be the Place” are also beautiful in their simplicity and poetry, as Byrne sings about finding comfort in the love of his partner. He describes himself as “just an animal looking for a home / and share the same space for a minute or two” and wondering “Did I find you or you find me?” The band very rarely recorded love songs during its career, but this composition is one of the best love songs of the ’80s. On a personal note, I used it as the recessional song at my wedding. Speaking In Tongues remains one of the band’s most successful albums, both critically and commercially. It earned the group some of the most favorable reviews of its career, and was certified double platinum. Talking Heads’ tour to support the album is also well known. The group designed the subsequent concert as a high-concept multi-media experience, which wasn’t really done back then. Acclaimed director Jonathan Demme filmed three of the group’s Los Angeles shows, and pieced the footage together to make Stop Making Sense (taken from a lyric from “Girlfriend Is Better”), creating one of the best concert films of all time. The film’s soundtrack is also one of the best live albums of all time. Talking Heads put out three more studio albums before breaking up in the late ’80s. Musically, the group continued to release more accessible music in the most Talking Heads way possible. Speaking in Tongues set them on that path, and provided the best of all possible worlds for the group that still defies description.